We have reached the time of year again when many people, myself included, begin to get back into the pool or down to the beach for some swimming. Be it training for an event such as an ocean swim, or for general fitness and health, it is a great Australian pastime. There are generally two types of swimmers that are encountered in the summer months: those who swim year round, and those who swim in the warmer months only with the aim of getting fit or competing in and completing an event. Both types of swimmers are susceptible to shoulder problems, but the latter group are often the ones more likely to experience some form of shoulder pain each summer. There is an almost endless list of factors that may contribute to the development of ‘swimmers shoulder’. The aim here is to give a few tips to minimise the risk of running into problems this summer and in the future. If you are a ‘summer only’ swimmer, it is often a good idea to start your training using flippers. If you are a ‘summer only’ swimmer, it is often a good idea to start your training using flippers. The extra propulsion that the flippers give you allows you to slow down your stroke and take a significant load off your shoulders. It also means that you are doing fewer stroke repetitions per training session in the early stages. Although swimming with flippers in a pool can be a bit of a hassle, it is worth considering in the first few weeks of your swimming. To progress your routine in the first 2-3 weeks, stick to a fairly consistent training distance or duration, but gradually wean yourself off the flippers. This increases the workload on your shoulders gradually, minimising your risk of overuse injuries. There are a few technique issues I come across when dealing with swimmers, a few that are easily fixed, but some old habits die hard! Many swimmers breathe to one side only. This not only makes swimming more difficult, but it increases the risk of developing shoulder impingement problems. There is some debate as to which shoulder is more likely to be injured, but there is widespread agreement that unilateral (one-sided) breathers are at greater risk of shoulder problems than bilateral (both sides) breathers. If you’re in the ocean, try not to lift your head and look up in front of you too frequently. This increases the strain on both your neck and shoulders, and causes your feet to sink in the water. Aim to swim in a straight line by orientating yourself to a fixed point in the distance or your shadow on the ocean floor, and using the direction of the wind chop on the water. Try to look up only once every 50-60 strokes and your efficiency in the water will improve significantly, minimising fatigue. Swimming is an exercise that requires internal rotation of the shoulder against the resistance of the water. This can cause muscle imbalances around the spine and shoulder that increase the likelihood of impingement in the shoulder. The pectoral (chest) and latissimus dorsi muscles are frequently stronger and tight in swimmers, and the muscles that externally rotate the arm and pull back the shoulder blades are often relatively weaker compared to the anterior (front) muscles. This imbalance causes the typical round shouldered posture seen in many swimmers. Not only does this contribute to impingement, but it often leads to a loss of flexibility and normal movement in the thoracic spine. 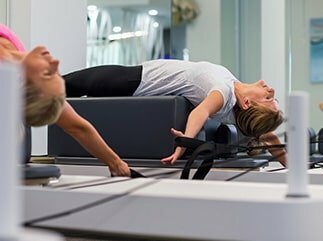 The movements that are most commonly restricted are extension (straightening) and rotation. Both of these thoracic movements are crucial to an efficient swimming technique. These problems are relatively easily avoided by an appropriate stretching and strengthening program. Stretches should focus on improving the flexibility of the internal rotator muscles of the shoulder and of the joints in the thoracic spine. 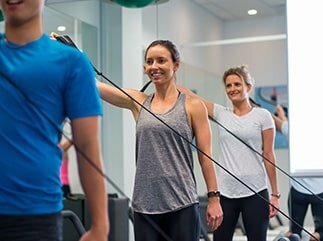 Strengthening exercises for the external rotators of the shoulder and the shoulder blade retractors will compliment the flexibility and allow optimal position of the shoulder blades and shoulder joint. Distance swimming is an endurance based rather than a power based exercise, and this needs to be reflected in the type of strengthening exercises you do. Being able to lift a significant weight for a handful of repetitions with your external rotators may well increase your muscle bulk and strength, but the chances are that these muscles will be exhausted by the time you have completed more than a few laps. High repetition, low load weights will improve your fatigue resistance significantly. If are experiencing any pain involved with swimming then Tom is available at our Bridgepoint Clinic Mon/Tues/Thurs/Fri/Sat. Call 9968 3424 for an appointment.